When I posted the translation of the Norwegian article, about the ICTY researchers' report on death tolls in the Bosnian War, I was certainly hoping it would get noticed. Sure enough, it was. Although the legacy media, those fabricators and guardians of Official Truth, haven't deigned to actually mention this blog by name, or the actual numbers (which I credited fully to the Norwegian report), it seems there's already been an effort to discredit the information. Asked about reports circulating on Serbian weblogs that his figures disproved the accepted fact that Muslims were by far the main victims, he said he was unaware of such a story but could deny it completely. First of all, this isn't a "Serbian weblog." It's a libertarian weblog, run by an ethnic Serb. Indeed, my ethnic identity isn't on display anywhere on the blog; one would have to read my column to figure it out. So either Reuters people did the research, or they assumed this is a "Serbian weblog" simply because it dared question the dogma of Muslim victimhood. But either way, it's an ad hominem - because all I did was quote a Norwegian report about the two researchers working for the Hague Inquisition of all things. About 70 percent of victims were Muslims, Tokaca said, rebutting internet rumours that his Investigation and Documentation Centre would show the toll was about the same on all three sides. 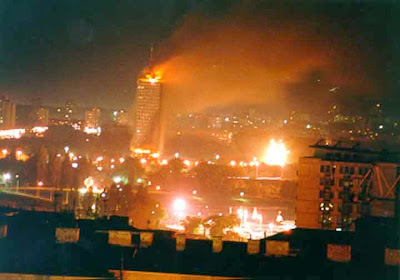 "The researchers estimate the number of killed civilian Muslims and Croats to be around 38,000, while the number of killed civilian Serbs was about 16,700. Among military personnel, the researchers think close to 28,000 people were killed in the government army, mostly Bosnian Muslims. On the Serb side, 14,000 soldiers were killed, while a bit over 6,000 Bosnian Croat soldiers lost their lives because of actions of war." The combined Muslim-Croat death toll here is 69.5%. This is hardly 70% of Muslims alone! Additionally, as I've noted in a follow-up comment to the original post, any consideration of the the combined Muslim/Croat total must take into account that some of the victims come from the fierce Muslim-Croat and Muslim-Muslim fighting. Let's look at the military totals now, because the numbers have been broken down by ethnicity (although again, there's no accounting for the extent of the Muslim-Croat and Muslim-Muslim fighting): Serb deaths are 16,000, which is 32% of the total (50,000). Croats fare somewhat better: 12%, at 6000. Which leaves the Muslims, at 28,000, at 56% of military casualties. So even if Tokaca added Muslims and Croats together, he'd only get a 68% total - and given that a portion thereof is mutually inflicted, it's hardly proper methodology. There is one more consideration, which I've used to argue this was not a war of "aggression and genocide," as Muslims claim, but a civil war. The civilian deaths are roughly proportional to 1991 census figures, where Muslims were 44% of Bosnia's population, Croats 17%, and Serbs about 34%. Military deaths are obviouly a bit lopsided at the detriment of Muslims, but there are two things to consider: Izetbegovic's forces fought Serbs, Croats and other Muslims; and the quality of their military was generally poorer, due to a patronage system that rewarded loyalty to Izetbegovic over military skill. To recap, then: I have claimed nothing that is not readily obvious from the Norwegian article; Tokaca's claims are not supported by those numbers, and he did not release his own; and Reuters, whether institutionally or on the intiative of its local reporter, misinterpreted the claims made here on account of the author's ethnicity - or worse yet, assumed the author's ethnicity based on the argument he was making. Of course, there is another possibility: that there is a Serbian blogger out there who did make the claims Reuters and Tokaca are seeking to deny, and their denials have nothing to do with Gray Falcon. But that doesn't change the falsehood of their arguments one bit.